Are you surprised that I have cast on for yet another pair of socks? Yeah, neither am I. After all, this is the year of socks, or so it seems. I know I said I wasn't going to knit the next pair of socks as plain vanilla, but you know what? I've got a lot on my plate and who isn't busy during the summer? 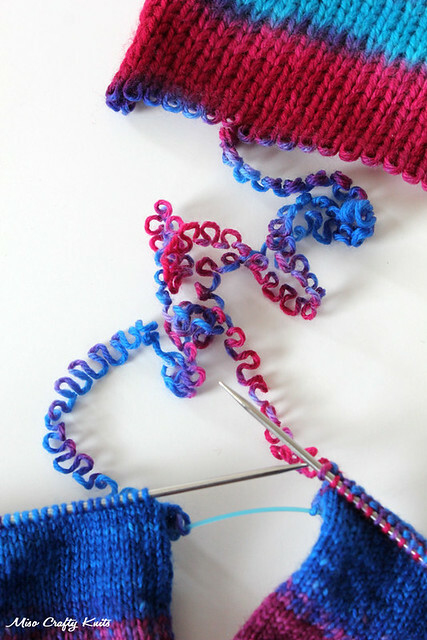 I need a mindless knit that I can pick up whenever and don't have to spend 5 minutes trying to figure out where I am in the pattern each time - especially during the off moments on the bigger projects that I'm working on. To save me from the same old plain vanilla routine, I'm doing something a little different with the heel. As I had mentioned in my June Obsessions post I've been thinking a lot about trying out the Fish Lips Kiss Heel by Sox Therapist. So that's what I'll be doing with this pair. I thought about knitting these socks leg-down but figured I should try toe-up since the main reason why I'm trying this new heel out is because I wanted to see how they'll work if I were to knit them with self-striping yarns (even though the yarn I'm using isn't really self-striping). Without digging around in the stash I had already decided that I should knit with the sock blank that I had handpainted in the Dyeing to Get Some Colour dye workshop that I took 2 years ago, taught by Felicia Lo of SweetGeorgia Yarns. 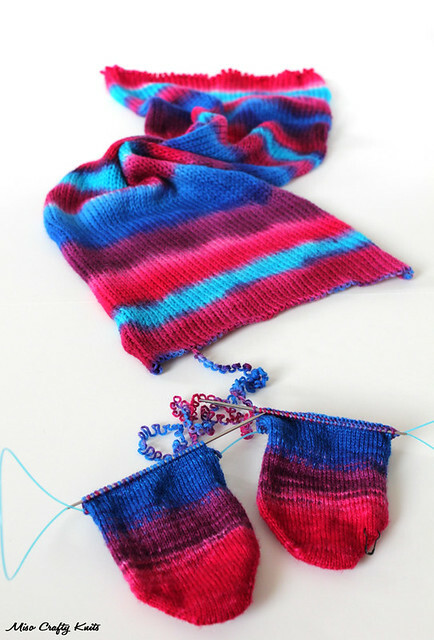 I've never knit from a sock blank before and had actually never seen one until I bought a few from Knit Picks months before the workshop (I just discovered this morning that Knit Picks has discontinued the sock blanks and are no longer on the website!). For those of you who don't know what a sock blank is, it's an undyed, usually double-stranded, loosely knitted piece of fabric that you can dye and then unravel as you knit from it. On my blank there's no cast on or bound off edges so all the stitches are live and needs no cutting to get started. 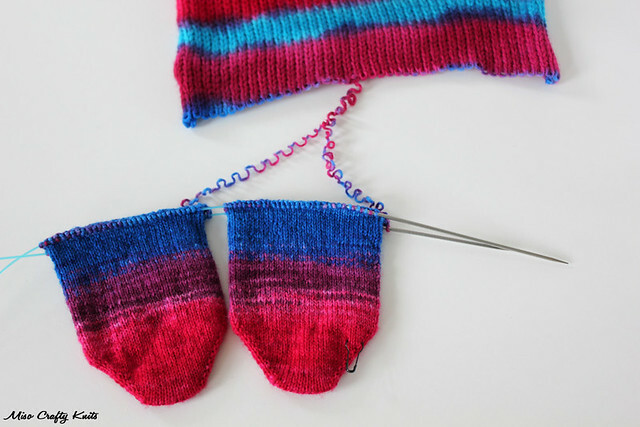 There are several ways you can knit from a sock blank: either 2 at a time, one sock at a time while winding the second strand, or wind up both strands before you start knitting. I thought the last 2 were pointless and so I just started knitting 2 at a time socks. Normally when I knit 2 at a time it's not your typical 2-socks-on-1-large-circular-needle. 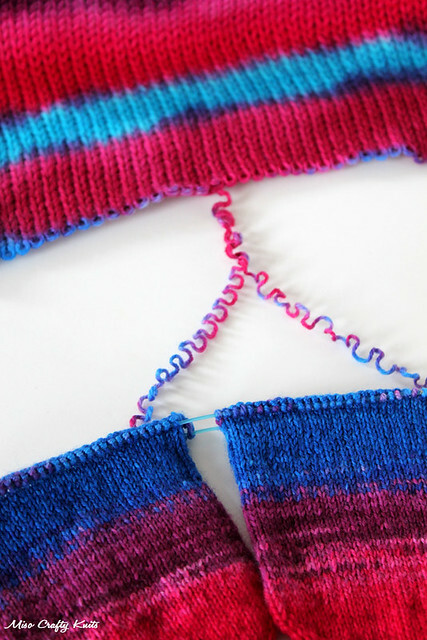 No, I like to knit the pair on 2 separate circulars. I prefer more room on my cable and don't like how finicky the knitting can get when they're both on the same needle. So that's what I started to do when I had cast on my socks. After a few rounds I discovered that keeping track of the strands and having to untangle them constantly was getting on my nerves. So I bit the bullet and shoved them both onto 1 circular. It wasn't that bad since the start of toe-up socks are pretty small and so it made the knitting bearable. I have to admit that this 2 at a time business really does yield faster results as I've now knit up both feet and am ready to knit the heels! I've been knitting one sock at a time since the beginning of the year and not the two (for reasons I'm not quite sure), so this progress definitely pleases me. But alas, this 1 circ thing couldn't last long. Yep. Since taking these photos I've transferred one sock onto another circ and have started the heel on just one sock. I was using a 40 inch circular and trying to manoeuvre the heel on one sock while the other hung out drove me nuts and felt a little claustrophobic. But hey, for a technique that I'm not a fan of knitting, be glad I lasted this long! At least I tried! I'm really loving how the transitions from one colour to the next is working out. The stripes on the blank is far from perfect and so the colours gradually blend into one another with random stitches of colour here and there. Don't think I'm going to get into dyeing yarn any time soon though. I'll leave that to the professionals! Dyeing this blank was time consuming and the most basic of basic, as in I grabbed the bottles of colours that I loved and squirted them across the blank. There was no planning whatsoever. Although you really do have to think it out and make sure that when the colours meet they don't mix and turn brown (unless you want brown). I kind of lucked out and the blended colours turned out either purple or a darker shade of blue, which all goes with the colours that I had used. The idea of trying to replicate this blank is completely out of the picture! I don't have the patience for such preciseness. I would rather knit the yarn than dye it! Your socks are looking fabulous! I've never knit from a blank (or dyed one) but the resulting socks look like I should definitely give in a shot. I'm crazy about them. However two at a time on one circ? I don't think I have the patience for that! Wow they look fabulous. I think I need to try the 2 circs for socks. Question: How are you managing to split the sock blank to 2 socks at a time? I am just looking at the picture and can't seem to follow where the other yarn is coming from to which sock. Thanks!